Stone Age people in Israel collected the seeds of wild grasses some 10,000 years earlier than previously recognised, experts say. These grasses included wild emmer wheat and barley, which were forerunners of the varieties grown today. The evidence comes from a collection of 90,000 prehistoric plant remains dug up at Ohalo in the north of the country. The Ohalo site was submerged in prehistoric times and left undisturbed until recent excavations by Ehud Weiss of Harvard University and his colleagues. This low-oxygen environment beautifully preserved the charred plant remains deposited there in Stone Age times. Archaeologists have also found huts, camp fires, a human grave and stone tools at the site. Most of the evidence points to the Near East as the cradle of farming. 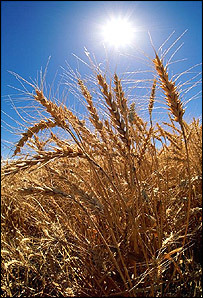 Indeed, the principal plant foods eaten by the people at Ohalo appear to have been grasses, including the wild cereals emmer wheat and barley. Grass remains also included a huge amount of small-grained wild grasses at Ohalo such as brome, foxtail and alkali grass. However, these small-grained wild grasses were to disappear from the human diet by about 13,000 ago. Anthropologists think farming may have started when hunter-gatherer groups in South-West Asia were put under pressure by expanding human populations and a reduction in hunting territories. This forced them to rely less heavily on hunting large hoofed animals like gazelle, fallow deer and wild cattle and broaden their diets to include small mammals, birds, fish and small grass seeds; the latter regarded as an essential first step towards agriculture. These low-ranking foods are so-called because of the greater amount of work involved in obtaining them than the return from the foods themselves. Investigations at Ohalo also show that the human diet was much broader during these Stone Age times than previously thought. "We can say that such dietary breadth was never seen again in the Levant," the researchers write in their Proceedings paper. Danish Girls Develop Breasts a Year Earlier Than They Did 15 Years Ago.